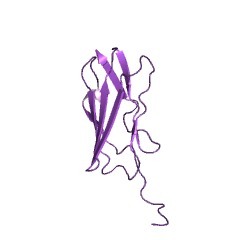 These form a rod-like structure in the actin-binding cytoskeleton protein, filamin. 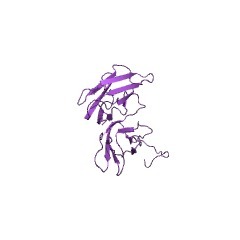 The C-terminal repeats of filamin bind beta1-integrin (CD29). 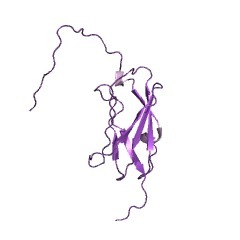 The many different actin cross-linking proteins share a common architecture, consisting of a globular actin-binding domain and an extended rod. 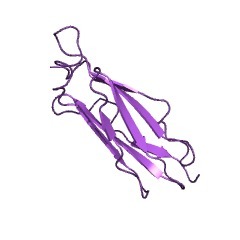 Whereas their actin-binding domains consist of two calponin homology domains (see IPR001715), their rods fall into three families. The rod domain of the family including the Dictyostelium discoideum (Slime mould) gelation factor (ABP120) and human filamin (ABP280) is constructed from tandem repeats of a 100-residue motif that is glycine and proline rich [(PUBMED:9164464)]. The gelation factor's rod contains 6 copies of the repeat, whereas filamin has a rod constructed from 24 repeats. 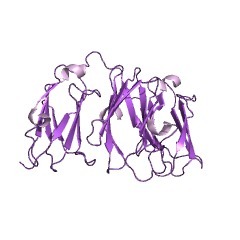 The resolution of the 3D structure of rod repeats from the gelation factor has shown that they consist of a beta-sandwich, formed by two beta-sheets arranged in an immunoglobulin-like fold [(PUBMED:9164464), (PUBMED:10467095)]. 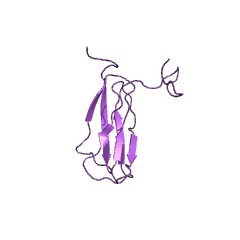 Because conserved residues that form the core of the repeats are preserved in filamin, the repeat structure should be common to the members of the gelation factor/filamin family. 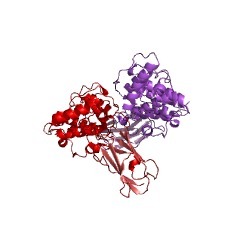 The head to tail homodimerisation is crucial to the function of the ABP120 and ABP280 proteins. 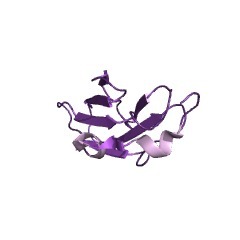 This interaction involves a small portion at the distal end of the rod domains. For the gelation factor it has been shown that the carboxy-terminal repeat 6 dimerises through a double edge-to-edge extension of the beta-sheet and that repeat 5 contributes to dimerisation to some extent [(PUBMED:9417983), (PUBMED:10467095), (PUBMED:2668299)]. There are 64366 IG_FLMN domains in 8225 proteins in SMART's nrdb database. Taxonomic distribution of proteins containing IG_FLMN domain. This tree includes only several representative species. The complete taxonomic breakdown of all proteins with IG_FLMN domain is also avaliable. 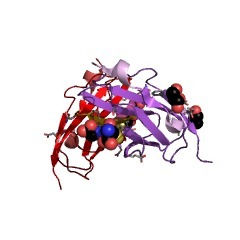 Click on the protein counts, or double click on taxonomic names to display all proteins containing IG_FLMN domain in the selected taxonomic class. 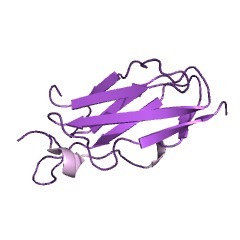 Molecular architecture of the rod domain of the Dictyostelium gelation factor (ABP120). 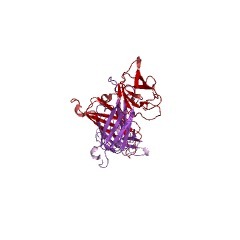 The Dictyostelium discoideum gelation factor is a two-chain actin-cross-linking protein that, in addition to an N-terminal actin-binding domain, has a rod domain constructed from six tandem repeats of a 100-residue motif that has an immunoglobulin fold. To define the architecture of the rod domain of gelation factor, we have expressed in E. coli a series of constructs corresponding to different numbers of gelation factor rod repeats and have characterised them by chemical crosslinking, ultracentrifugation, column chromatography, matrix-assisted laser desorption ionisation (MALDI) mass spectrometry and NMR spectroscopy. Fragments corresponding to repeats 1-6 and 5-6 dimerise, whereas repeats 1-5 and single repeats 3 and 4 are monomeric. Repeat 6 interacts weakly and was present as monomer and dimer when analysed by analytical ultracentrifugation. 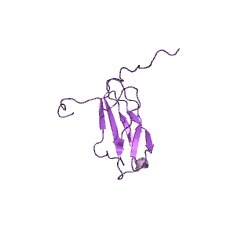 Proteolytic digestion of rod5-6 resulted in the generation of two polypeptides that roughly corresponded to rod5 and part of rod6. 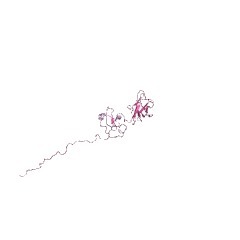 None of these polypeptides formed dimers after chemical crosslinking. Stable dimerisation therefore appears to require repeats 5 and 6. Based on these data a model of gelation factor architecture is presented. 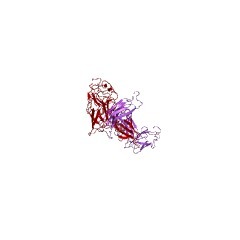 We suggest an arrangement of the chains where only the carboxy-terminal repeats interact as was observed for filamin/ABP280, the mammalian homologue of gelation factor. 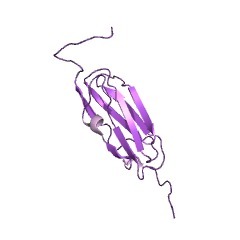 Filamin binds to the cytoplasmic domain of the beta1-integrin. 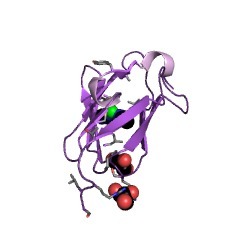 Identification of amino acids responsible for this interaction. 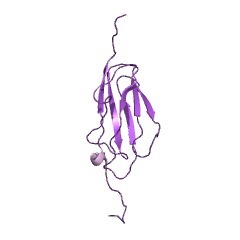 Integrins play an important role in regulating cell adhesion, motility, and activation. 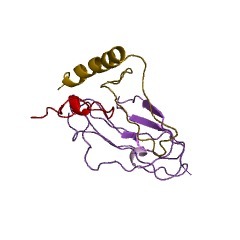 In an effort to identify intracellular proteins expressed by activated T cells that interact with the cytoplasmic domain of beta1-integrin (CD29), we used the beta1-integrin cytoplasmic domain as bait in the yeast two-hybrid system. 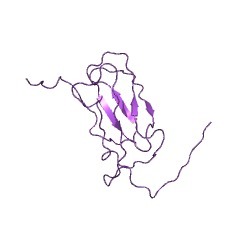 Here we report that the cytoplasmic domain of beta1-integrin specifically interacts with the cytoskeletal protein filamin. 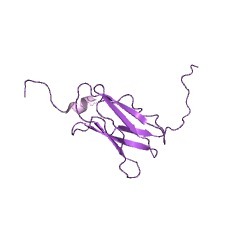 This interaction required all but the most carboxyl-terminal three residues of the cytoplasmic domain of beta1, and the carboxyl-terminal 477 residues of filamin containing the terminal 4. 5 approximately 96-residue tandem repeats of filamin. 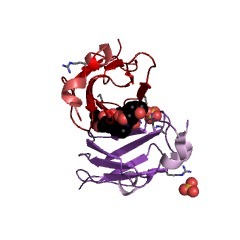 To verify this interaction in vivo, we showed that filamin specifically coprecipitated with beta1 in mammalian cells. 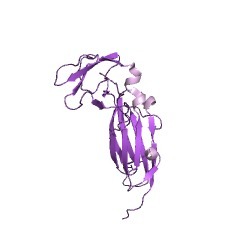 We also showed that recombinant filamin chimeric proteins were able to bind to the beta1 cytoplasmic domain in vitro. 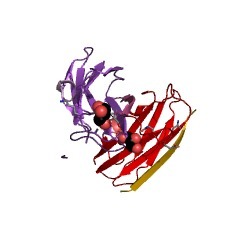 We observed that a subset of single point mutations in the cytoplasmic domain of beta1, which had been previously reported to impair its function, disrupt the interaction between beta1 and filamin. 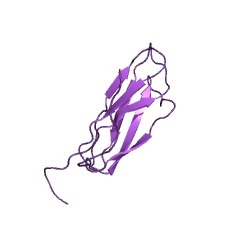 Taken together, these findings suggest that the interaction between beta1 and filamin, which in turn can bind actin, provides a mechanism for the interaction of this cell surface receptor with cytoskeletal proteins and that this interaction plays a role in normal receptor function. 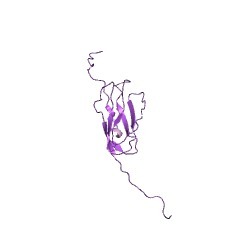 Integrin beta cytoplasmic domains differentially bind to cytoskeletal proteins. 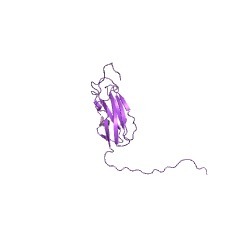 Integrin cytoplasmic domains connect these receptors to the cytoskeleton. Furthermore, integrin-cytoskeletal interactions involve ligand binding (occupancy) to the integrin extracellular domain and clustering of the integrin. To construct mimics of the cytoplasmic face of an occupied and clustered integrin, we fused the cytoplasmic domains of integrin beta subunits to an N-terminal sequence containing four heptad repeat sequences. The heptad repeats form coiled coil dimers in which the cytoplasmic domains are parallel dimerized and held in an appropriate vertical stagger. 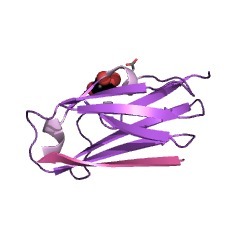 In these mimics we found 1) that both conformation and protein binding properties are altered by insertion of Gly spacers C-terminal to the heptad repeat sequences; 2) that the cytoskeletal proteins talin and filamin are among the polypeptides that bind to the integrin beta1A tail. 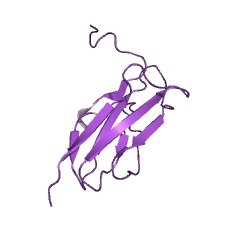 Filamin, but not talin binding, is enhanced by the insertion of Gly spacers; 3) binding of both cytoskeletal proteins to beta1A is direct and specific, since it occurs with purified talin and filamin and is inhibited in a point mutant (beta1A(Y788A)) or in splice variants (beta1B, beta1C) known to disrupt cytoskeletal associations of beta1 integrins; 4) that the muscle-specific splice variant, beta1D, binds talin more tightly than beta1A and is therefore predicted to form more stable cytoskeletal associations; and 5) that the beta7 cytoplasmic domain binds filamin better than beta1A. The structural specificity of these associations suggests that these mimics offer a useful approach for the analysis of the interactions and structure of the integrin cytoplasmic face. 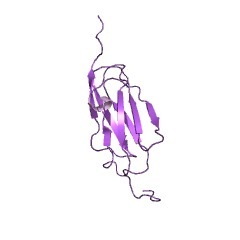 Human beta-filamin is a new protein that interacts with the cytoplasmic tail of glycoprotein Ibalpha. 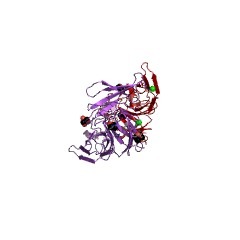 We have cloned and sequenced a 9.4-kilobase cDNA specifying a new 280-kDa protein interacting with the cytoplasmic tail of glycoprotein (Gp) Ibalpha and showing considerable homology to actin-binding protein 280 (ABP-280) and chicken retinal filamin. 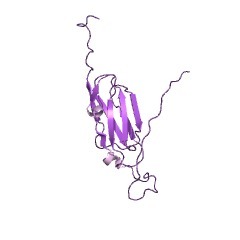 We term this protein human beta-filamin. 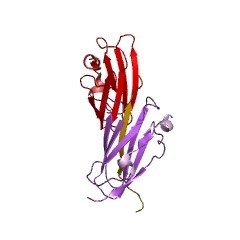 The gene for beta-filamin localizes to chromosome 3p14.3-p21.1. 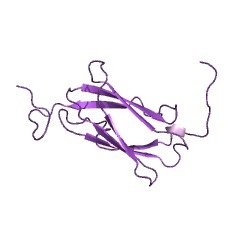 beta-Filamin mRNA expression was observed in many tissues and in cultured human umbilical vein endothelial cells (HUVECs); only minimal expression was detected in platelets and the megakaryocytic cell line CHRF-288. 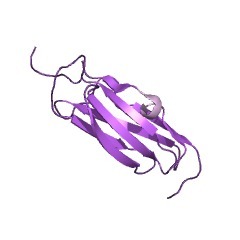 Like ABP-280, beta-filamin contains an NH2-terminal actin-binding domain, a backbone of 24 tandem repeats, and two "hinge" regions. 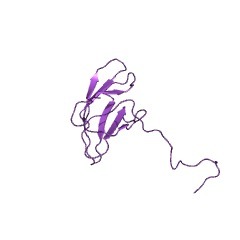 A polyclonal antibody to the unique beta-filamin first hinge sequence identifies a strong 280-kDa band in HUVECs but only a weak band in platelets, and stains normal human endothelial cells in culture and in situ. 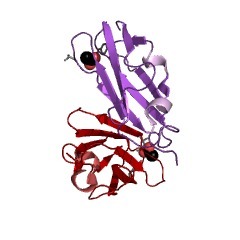 We have confirmed the interaction of beta-filamin and GpIbalpha in platelet and HUVEC lysates. 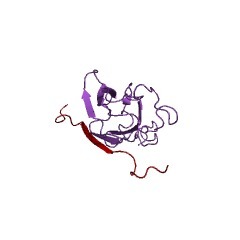 In addition, using two-hybrid analysis with deletion mutants, we have localized the binding domain for GpIbalpha in beta-filamin to residues 1862-2148, an area homologous to the GpIbalpha binding domain in ABP-280. 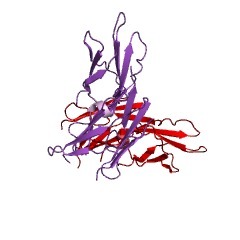 beta-Filamin is a new member of the filamin family that may have significance for GpIbalpha function in endothelial cells and platelets. 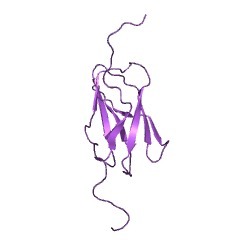 A novel human actin-binding protein homologue that binds to platelet glycoprotein Ibalpha. 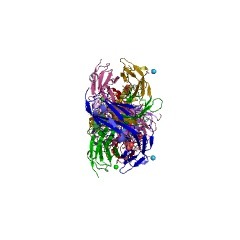 Glycoprotein (GP)Ib-IX-V is one of the major transmembrane complexes present on the platelet surface. 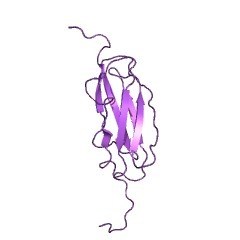 Its extracellular domain binds von Willebrand factor (vWF) and thrombin, while its intracellular domain associates tightly with the cytoskeleton through the actin-binding protein (ABP)-280, also known as filamin. In the present study, a full-length cDNA coding for a human ABP homologue has been cloned and sequenced. 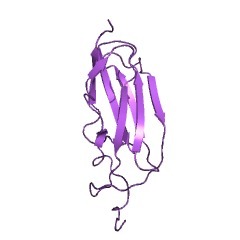 This protein was identified by the yeast two-hybrid screening procedure via its interaction with the intracellular domain of GPIbalpha. Initially, a 1.3-kb partial cDNA was isolated from a megakaryocyte-like cell line (K562) cDNA library followed by a full-length cDNA of 9.4 kb that was identified in a human placenta library. 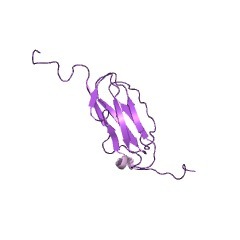 The full-length cDNA encoded a protein of 2,578 amino acids with a calculated molecular weight of 276 kD (ABP-276). 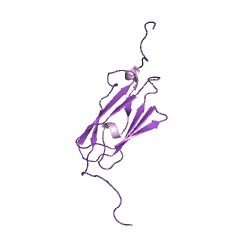 The amino terminal 248 amino acids contained an apparent actin binding domain followed by 24 tandem repeats each containing about 96 amino acids. 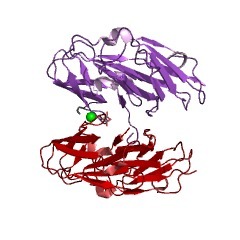 The amino acid sequence of the protein shared a high degree of homology with human endothelial ABP-280 (70% identity) and chicken filamin (83% identity). 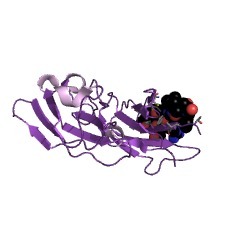 However, the 32 amino acid Hinge I region in ABP-280 that contains a calpain cleavage site conferring flexibility on the molecule, was absent in the homologue. 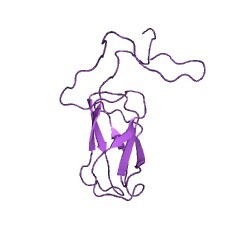 An isoform containing a 24 amino acid insertion with a unique sequence at the missing Hinge I region was also identified (ABP-278). 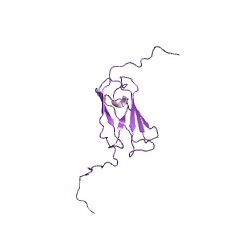 This isoform resulted from alternative RNA splicing. ABP-276 and/or ABP-278 were present in all tissues examined, but the relative amount varied in that some tissue contained both forms, while other tissue contained predominately one or the other. This information is based on mapping of SMART genomic protein database to KEGG orthologous groups. 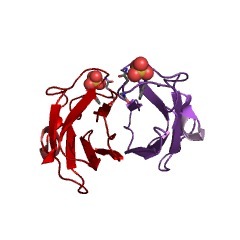 Percentage points are related to the number of proteins with IG_FLMN domain which could be assigned to a KEGG orthologous group, and not all proteins containing IG_FLMN domain. Please note that proteins can be included in multiple pathways, ie. the numbers above will not always add up to 100%.